Please click here to sign a Change.org petition calling on San Francisco State University to end its 2014 memorandum of understanding (MOU) with An-Najah University, a Palestinian school that promotes radicalism and violence. Originally published under the title "California State College Defends Partnership with Radical Palestinian University." This text differs slightly. A March 21 Facebook post shows the logo of the Fatah student branch at An-Najah, with fist-map of "Palestine" excluding Israel. 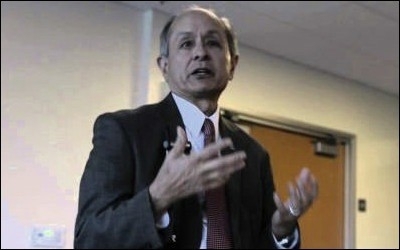 In 2016, the Middle East Forum (MEF) launched a campaign calling on San Francisco State University (SFSU) President Leslie Wong to end the school's 2014 memorandum of understanding (MOU) with An-Najah University — a college in the West Bank that promotes radicalism and Palestinian violence. Since that time, Palestinian Media Watch (PMW) has documented two cases of a Najah student group promoting terrorism. 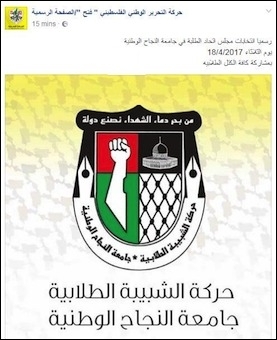 Last month, PMW reported that Shabiba — the student branch of Palestinian Authority (PA) President Mahmoud Abbas's Fatah movement at Najah — displayed a logo (above right) on Fatah's official Facebook page featuring a coat of arms with a "resistance" fist in the shape of a PA map of "Palestine" encompassing all of Israel. It was accompanied by the violent slogan, "From the sea of blood of the martyrs, we will create a state." Then, on March 29, Fatah's Facebook page featured Shabiba's call for a day of terror against Israel on April 17. Shabiba promised to "to burn the land under the feet of the tyrants," and threatened to replicate a previous terror attack in which 16 people were murdered. In addition, the Middle East Media Research Institute (MEMRI) noted that the Shabiba group at Bir Zeit University in Ramallah marked Fatah's anniversary in December 2016 with a military parade of armed, masked men in fatigues shouting, "This is a call to arms," and, "Blow up the head of the settler!" Professor Rabab Abdulhadi has worked to forge "collaborative agreements" between SFSU and two Palestinian universities. SFSU professor Rabab Abdulhadi (who set up the MOU with Najah) has expressed a desire to create a similar partnership with Bir Zeit, where she served as a visiting professor in 1998. She also has said that she hopes to expand these relationships to "other universities in Palestine and elsewhere in the Arab world, as well as in Muslim majority countries." 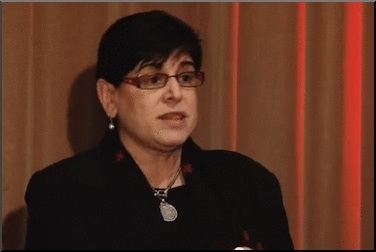 When asked by the Algemeiner to comment on Najah's extremism, an SFSU spokesperson said that the university had no intention of breaking off its relationship with the Palestinian school, labeling the MOU merely a "goodwill document that demonstrates an intention to collaborate," though a "specific project [to do so] has not yet been identified." This claim is disingenuous, in light of Abdulhadi's 2016 "Freedom Behind Bars Workshop," the first known event facilitated by the MOU. The workshop involved sending Americans who served time in prison for crimes — ranging from bombing the United States Senate, to conspiracy to commit murder — to meet with fellow former "political prisoners" at Najah. As a public university that receives both state and Federal funds, SFSU used taxpayer dollars to connect violent American radicals to their counterparts in the Middle East. This leaves no doubt about the kind of "projects" the MOU will enable: pro-terrorist, anti-American and anti-Israel. Nor does President Wong's refusal to acknowledge MEF's repeated requests for comment on the MOU and the obvious security concerns posed by any student or faculty exchange program. Because radicalization has led to numerous terrorist attacks in the U.S., such collaboration poses a clear risk. SFSU President Leslie Wong has refused even to acknowledge repeated requests to comment about the MOU. Wong's silence on the MOU persists, despite MEF presenting copious documentation about Najah's long history of radicalism, incitement to violence, glorification of terrorism, and student participation in terror attacks. There's a reason the Washington Institute for Near East Policy describes Najah as a hub for the "terrorist recruitment, indoctrination and radicalization of students," while Hamas proudly dubs the school a "greenhouse for martyrs." Therefore, the SFSU's spokesperson's pledge to take student and faculty safety into consideration when implementing the MOU rings hollow. The Algemeiner placed SFSU tenth on its 2016 list of "The 40 Worst Colleges for Jewish Students" largely because of the MOU with Najah. As Algemeiner editor Dovid Efune put it: "If you can imagine for second what it's like to be a Jewish student on this campus and know that there is a formal agreement with an institution that has hosted terrorism ... it's going to leave you feeling uncomfortable." SFSU's disgraceful agreement with Al-Najah must be rescinded. Wong should apply that same honesty to the indefensible decision to partner with Najah, but instead, he has doubled down, describing the MOU as "one of my goals and dreams." Meanwhile, Abdulhadi has falsely accused MEF of engaging in a "McCarthyist attack" and "a witch hunt campaign," and seeking "to whip up hysteria, Islamophobia, racism, and xenophobia to divert attention from Israeli criminality." Her academic and activist cohorts have predictably mimicked her rhetoric. It is time for California State University System Chancellor Timothy P. White to terminate the MOU, and for the California State Assembly and the US Congress to hold hearings into the matter. This disgraceful agreement must be rescinded. Cinnamon Stillwell is the West Coast Representative of Campus Watch, a project of the Middle East Forum.